History, by and large, tends to be considerably more complicated than our pop cultural understanding of it. A historical movement as broad as the prohibition of alcohol in the United States, for instance, was the result of so much more than a mere crusade of moralistic teetotalers. Just as it’s grossly, hilariously simplistic to describe a conflict such as the Civil War as having been fought “to end slavery,” it’s equally myopic to think about a topic as complex as Prohibition in the terms of “drinkers vs. non-drinkers.” In reality, there were so many other racial, political, religious, economic and nationalistic factors in play that the full story is actually an unlikely coming-together of many groups with very disparate goals, held in a bizarre alliance by their opposition to the alcohol industry. With all of that said, though, there’s one aspect of the road to Prohibition that is undeniable, and that’s the American appetite for alcohol. In short: We have oftentimes been a nation of drunks, but by today’s standards, average alcohol consumption in large parts of the 19th century U.S.A. was almost beyond rational belief. You will likely find it hard to accept as a fact just how much booze the average American was consuming in the first half of the 1800’s. The figures are almost cartoonishly high, so let’s consider how we got there first. By 1700, the colonists drank fermented peach juice, hard apple cider, and rum, which they imported from the West Indies or distilled from West Indian molasses. Drinking was an important part of the culture, and people passed around jugs or bowls of liquor at barbecues, on market days, and at elections. Candidates gave away free drinks. A stingy candidate had no chance of winning. Practically everyone drank. Even restrained New Englanders consumed great quantities of liquor. The Puritans called alcohol the “Good Creature of God,” a holy substance to be taken proudly yet cautiously. When Rorabaugh writes “three and a half gallons of alcohol,” he’s talking about 3.5 gallons of pure ethanol, rather than gallons of a specific spirit. To convert that into a more graspable figure, that’s 8.75 gallons of standard, 80-proof liquor per year for the average person by the time of the American revolution. That’s already 45 percent higher than current consumption levels, but hold onto your seats, because the number gets much higher by the 1800s. Enjoy your pint of beer, I’ll be here with my pint of whiskey, thank you very much. Considering these figures, It would seem that a more historically accurate version of Lin-Manuel Miranda’s Hamilton would simply have all of the key characters slurring their way through every song, or perhaps falling off the stage. But the drinking levels were about to soar even higher. As the availability of whiskey soared, so did imbibing itself. “Staggering” is the appropriate word for the consequences of this sort of drinking. In modern terms, those seven gallons are the equivalent of 1.7 bottles of a standard 80-proof liquor per person, per week—nearly 90 bottles a year for every adult in the nation, even with abstainers (and there were millions of them) factored in. Once again figuring per capita, multiply the amount Americans drink today by three and you’ll have an idea of what much of the nineteenth century was like. As if it really needs saying, 7 gallons of ethanol per year, per capita, is an insane number. Consider this: My significant other and I both drink alcohol. 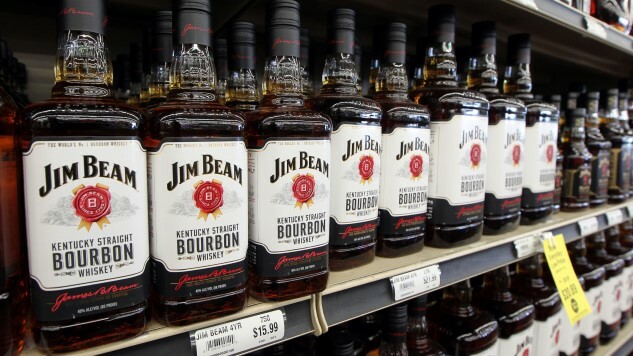 If we were drinking at 1830 levels, we would be plowing through roughly 3.4 standard, 750 ml bottles of Jim Beam White Label Bourbon per week, in a single household. Our livers would be sending us every conceivable manner of distress signal, assuming they didn’t immediately shut down. So, how much do Americans drink now, in the modern world? Well, the best figure for the current American alcohol consumption rate seems to be roughly 2.42 gallons of ethanol per year, per capita—still a healthy figure, but nearly three times less per capita than in 1830. At this point, you may be thinking something along the lines of “But does anywhere in the world drink as heavily as Americans did in 1830?” And it sure sounds like the answer is no—not even close, in fact. Today, the highest per capita alcohol consumption in the world belongs to the Eastern European nation of Belarus, which consumes roughly 4.62 gallons of ethanol per year, per capita. This is all to say the following: Even the booziest place on Earth in 2018 drinks at a rate that is only 66 percent as boisterous as Americans were doing in 1830. “The Drunkard” was the most popular and widely performed American play of the 1840s, and for good reason. Ultimately, the 1830 figure represents the peak moment in American alcohol consumption, and knowing this, it becomes much more understandable that this is when the temperance movement (which would eventually become the Prohibition movement) first began to coalesce and gain steam. The rate of alcohol consumption leveled off and then began steadily decreasing through the later 1800s, with a nadir in the years leading up to Prohibition. Drinking rates recovered after Prohibition’s end (our modern highs were in the early 1980s), but never got above 3 gallons of ethanol per year, let alone 7 gallons. So, the next time you think it seems like we’re living in a boozy society, consider the fact that even an average consumer today would be considered a practical teetotaler by the standards of 190 years ago. Now, if you’ll excuse me, I have 1.7 bottles of whiskey to consume this week, so I’d better get to it. Jim Vorel is a Paste staff writer and resident craft beer/brown liquor geek. You can follow him on Twitter for more drink writing.